Diving in the Caribbean couldn't be sweeter. If you've always wanted to swim with brilliant fish in tropical waters but haven't had the time to learn to dive, the Caribbean is the place for you. Most dive shops in the Caribbean are rated by PADI and have skilled instructors who can teach you everything you'll need to know. Visit the links below and plan ahead for your dream vacation in the sun. Animal Encounter Dive Center is new and provides Quality and safety on the highest level with all Dive activities. We're a PADI and WOSD resort and provide all courses from PADI, WOSD and IAHD. Besides courses you can choose from our Animal Scuba Encounters and our Dolphin Scuba Encounters. The best thing about these Encounters is that both divers and non-divers can participate in these exciting activities, even at the same time. After a short briefing, you are free to seek out the adventure of being surrounded by turtles, rays, sharks and many other fish looking to get some of your food, or participate in the Dolphin interactive world. But to get to know our complete program just visit our website. St Lucia's warm clear waters, abundant colourful fish and coral combined with varied diving and snorkeling sites guarantee some of the best scuba diving and snorkelling in the Caribbean. Scuba Steve's Diving is run by British couple, Stephen and Shirley Smith. We are both PADI Instructors passionate about diving and about "simply beautiful" St. Lucia. To help us operate Scuba Steve's Diving we have Ricardo Theobalds and Benton Yoyo our Licensed Boat Captains and Allencius Martyr and Furlene Martyr our PADI Instructors. Between us, we have nearly 50 years diving experience and over 6000 dives in St. Lucia. We are located at Village Cay Hotel & Marina, Road Town, Tortola adjacent to the cruise ship dock, allowing us fast and easy trips to the most popular dive sites in the BVI. Chris Juredin (owner/operator) has been diving in the BVI for over a decade. His fascination with history and shipwrecks has lead him to explore most of the waters surrounding the British Virgin Islands and the shipwrecks that lie therein. Let us introduce you to this unique island, from dramatic scuba diving, the best snorkeling sites, world class bonefishing, and more. Unspoiled and virtually undiscovered, Andros Island, Bahamas is a world apart from the crowds and is a true Bahamas Vacation. This small Bahamas all-inclusive resort is more than just another Bahamas hotel, we are the most established dive resort in the Caribbean. Our environment is very safe, peaceful, secluded, and a great romantic getaway. Come join us for a new adventure, a true Bahamas experience, a family vacation, a relaxing holiday retreat on the beach, or the Caribbean vacation of your dreams. The Oldest dive shop in St Maarten is owned and operated by longtime resident LeRoy French. With over 40 years experience in the diving field all efforts have been put into maintaining a high standard of operation in the shop. At Ocean Explorers we believe that choosing the right dive center makes the difference between an okay trip and an extraordinary diving experience. We would like to show you the best that St. Maarten has to offer! All dive trips and lessons are personally supervised and safety is the number one thought in mind. The shop is located on a quiet beach at Simpson Bay, with easy parking, and is stocked with first class quality equipment, for rent or for sale at reasonable prices. Eden Rock Diving Center is the gateway to the main attraction Eden Rock and Devil's Grotto reputed to be the second and third best shore dives in the world. Both reefs are just a short swim from shore. The best way to explore the caves and tunnels is with one of our experienced instructor guides who will make sure you see the best of Cayman's coral reefs. Want to get certified in Scuba Diving? Want to spend less time reading for the class while on Vacation? Through an interactive web-based program, you will hear, read and see the same material other student divers receive from interacting with the PADI Open Water Diver Manual and Video or Multimedia. The difference is that Knowledge Reviews, Quizzes and the Final Exam are corrected and remediated online. You will demonstrate knowledge development mastery and it's done at your convenience. Big John's Dive Antigua - Lecture, Instruction, boat dive and all equipment as part of the dive package. We also provide NAUI & PADI referral check-out dives and full certification courses. Dockyard Divers - The South Coast is where the Antigua and Barbuda Bank drops off abruptly and thus offers some excellent deep sites as well as beautiful shallower dives. Lorenzo's Scuba Dreams - Lorenzo's Scuba Dreams is a PADI dive shop located on the beach at the Royal Pavilion, Crystal Cove, Glitter Bay & private houses on the West Coast of Barbados. It was established in 1995 and is one of the longest established dive shops in Barbados. Sandals Grande Antigua - Every Sandals and Beaches Resort has dive facilities that appeal to both beginners, who probably don't know a regulator from a wet suit, and experienced certified divers. Aruba Pro Dive - Aruba Pro Dive's policy of small dive groups enables us to keep our schedules flexible and our dive trips unique. Unlike large group diving, our attention is focused on the individual. Our staff and our guests are happier as a result. Dive Aruba - Make your dive a pleasant experience. If you like to be among friends and don't want to get lost in the crowd, Dive Aruba is your answer. Dive Aruba brings you to the most exciting dive sites on the island and makes your dive an adventure. Mermaid Divers - There is no better way to discover Aruba's incredible scuba diving and unique marine life than with Mermaid experienced staff. Our Professional Instructors are PADI, NAUI, IDD, SSI and CMAS certified and have extensive experience focusing on safety first, relaxation and fun. Native Divers Aruba - We have PADI Open Water Certifications and Resort Courses and do Reef Diving, Wreck Diving, Night Diving and Boat Diving. Pelican Sports - Our Dive Center (Unique Sports of Aruba) provides PADI certified and qualified instructors with a solid knowledge of Aruba's dive sites who are very willing to share their experience and experiences with you. Novices and well-seasoned divers alike will enjoy this spectacular SCUBA diving experience. Transportation to and from the dive center is provided; the Caribbean is yours to explore. Red Sail Sports - Red Sail Sports is one of the world's leading resort based dive and watersports operators. With locations in Aruba and Grand Cayman, Red Sail Sports provides quality diving, sailing, watersports and retails services. Above and Below Abaco - Our mission is to provide the highest quality Bahamas SCUBA and Snorkeling Adventures, Instruction, Island Tours, and Sunset Cruises. Our goal is to provide an environment where our guests will feel renewed energy, vitality, and clarity as they enjoy our Island Experience. Bahamas Divers - Dive sites include a Bahama Divers exclusive, the famous Lost Blue Hole, a 200-foot wide natural opening in the ocean floor starting at a dept of 30 feet and descending to 200 feet. Intriguing wrecks with a fantastic array of colorful marine life. A 3,000 foot living wall on the Tounge of the Ocean that beckons experienced divers. Bahamas Diving Association - The Bahamas Diving Association is the official dive association of The Islands of The Bahamas. Bimini Undersea - Bimini has a wide variety of great dive sites to offer. Reefs, Wrecks, Walls, Drift Dives, Bimini's got it all. Although the Reef Structures themselves are very healthy, the main feature of Bimini's Diving is the Marine Life. Both the variety and sheer numbers of fish in the Bimini is astounding. The Dive Sites are in two major geographical areas. The Bimini (North & South Bimini) Area and the Cat Cay Area. Dive Guana - Join us for full day adventures including visits to Hope Town, Green Turtle Cay and Man-O-War Cay. Enjoy the best snorkeling and diving the Bahamas has to offer with our experienced, PADI certified guides. Grand Bahama Scuba - Our home, Grand Bahama, is blessed with unique features that have created diverse dive sites of great beauty. A broad shallow bank extends offshore bordered by a shallow barrier reef. The reef is followed by a gradual drop-off that slowly descends in a stepwise fashion to a vertical wall plunging from two hundred to two thousand feet. Kamalame Cay Diving - Near Kamalame is the third longest barrier reef in the world it is just a mile from our shores offering divers and snorkelers the perfect opportunity to enjoy the warm Caribbean waters while experiencing an exceptional underwater adventure. Ocean Fox - After years of offering diving, snorkeling, and deep sea fishing adventures to visitors to Harbour Island, Ocean Fox is excited to announce the opening of a second location, at Davis Harbour, South Eleuthera. Small Hope Bay - At Small Hope Bay Lodge on Andros Island, Bahamas, we have been introducing divers and snorkelers to the Andros Barrier Reef for almost half a century. Stuart Cove's Dive Bahamas - For more than 30 years we have been exploring the reefs, wrecks, and coral walls of Nassau. During this time we have discovered the best of what Nassau has to offer. Sunn Odyssey Divers - The staff consist of husband Nick Rolle and wife Karen Rolle, offering only the most personalized of services. These two owners have over 25 years experience in the diving industry, with zero accidents in their 15 years of operating Sunn Odyssey Divers in Freeport, Bahamas. Treasure Divers - Treasure Divers is a full service PADI Scuba Dive Facility situated inside the grounds of the Treasure Cay Hotel Resort and Marina, which is located in the center of Treasure Cay on the main island of Great Abaco in the Bahamas. Dive Blue Reef - Barbados has a very healthy reef structure with an abundance of fish life and creatures. We also are well blessed with some of the best wrecks in the Caribbean if not the world, notably the SS Stavronikita. We have PADI and B.S.A.C. instructors at our facility. Lorenzo's Scuba Dreams is a PADI dive shop located on the beach at the Royal Pavilion, Crystal Cove, Glitter Bay & private houses on the West Coast of Barbados. It was established in 1995 and is one of the longest established dive shops in Barbados. It is professionally and efficiently run, providing friendly and polite service and the best quality equipment on a comfortable and well-equipped dive boat. Reefers & Wreckers - Some consider us the best in Barbados scuba diving: visit our intact wrecks and beautiful Barbados coral reefs. All Reefers and Wreckers facillities are available to make your Barbados scuba dive experience much more comfortable. Caribbean scuba dive trips are designed to suit all levels of certification and experience. We have flexible, personalized and friendly service, one-to-one or small group diving is available. Explore perfectly preserved Barbadian wrecks, sunk for safe diving penetration and & snorkeling Scuba dive Barbados with Reefers and Wreckers. West Side Scuba Centre - There are 4 different wrecks that West Side Scuba dive, 2 marine parks and a turtle park. The most famous of the wrecks, the Stavronikita, has created a fascinating penetration dive for experienced divers. We also do twenty reef dives, from the south to the north. And in summer we also dive on the East Coast. Blue Water Divers - We are Bermuda's longest running diving & watersports centre with locations island-wide affording us the prime locations on the island to reach the most exciting wreck sites and the finest pristine reefs in Bermuda. Dive Bermuda - We are the only Instructor Development Centre located in Bermuda. With over 20 years experience of offering Scuba to local and visiting divers, Dive Bermuda knows the seas and reefs of Bermuda. Fantasea Bermuda - We are a Bermudian company offering the widest range of professionally operated tours, charters and recreational opportunities in the island. With our extensive range of boats, top of the line equipment, and professional staff, we have the resources and imagination to put together an activity program that is custom tailored to your needs. Triangle Diving - Come and enjoy world class diving in the shipwreck capital of the Atlantic. Every day we offer a two tank reef and wreck dive. On the first dive you will be guided by one of our professional dive masters on one of Bermuda's 300 shipwrecks. Abanks' Diving - Abanks' is just a short three minute walk from the George Town cruise ship landing, and we offer the only beach in George Town. Absolute Divers - We're one of the only operations in the Cayman Islands that welcomes families with small children. From your private dive charter watch as the overcrowded dive boats rush to and from Stingray city and dive sites, while you enjoy the relaxed atmosphere with your friends, family and the best diving in Cayman. Ambassador Divers - With an emphasis on the excellent dive sites on the West Side and South and North Wall, we offer a personalized experience to divers of all skill levels. We also offer a variety of courses in recreational, technical and free diving. Cayman Diving School - We offer personalized service to make your vacation a terrific memory of fantastic diving! We go to sites that you want to dive. Some of the popular sites are Big Tunnels, Trinity Caves, Orange Canyon, Tarpon Alley plus 100s more. Dive 'N Stuff - We will help you discover the most amazing dive sites in the Cayman Islands from the sheer drop offs of the famous walls to the wrecks and reefs that have made the Cayman Islands one of the top dive destinations in the world. Divers Down - Experience the best diving in Grand Cayman with Divers Down. We have been operating in Grand Cayman for 12 years and are proud to offer personalized dive trips in which we take out small groups. Divetech - Divetech is Grand Cayman's full service resort for world-class diving, offering the best quality training available, both recreational and technical, along with some great dive and room packages with Cobalt Coast Dive Resort and Lighthouse Point. Don Foster's Dive Cayman - Our office and dive shop are located on the water 600 yards south of the George Town Harbour. This is where most of our boats leave from for 1 & 2 tank dive trips. Indepth Watersports - Diving walls and reefs from the wall to Bloody Bay. Neptune's Divers - Our fun and friendly experienced staff guides every dive sharing their knowledge and love of the underwater realm and its inhabitants. We are computer friendly and buddy teams are welcome to buddy up and explore at their own pace. Ocean Frontiers - We're a modern dive operation with old style Caymanian hospitality. You'll find us very flexible; whenever you want to dive Cayman's East End, we'd love to take you. Red Sail Cayman - With over 160 dive sites, an abundance of friendly stingrays, tarpon and eels, Cayman's marine life is legendary. So is Red Sail Sports' 20 years of providing outstanding service. Seasports Diving - Whether you are a novice or an expert, on your first or your one hundred and first visit to Grand Cayman, we can create the unique, custom diving adventure that will live in your memory for years to come. Sunset House - Come to Sunset House today and experience now, what others have seen for the last 50 years, an underwater photographer's perfect dive, shipwrecks, curious big eels, cuddly stingrays and a legendary mermaid await you just steps from your room. Tortuga Divers - Tortuga Divers with Red Sail Sports welcomes you to the East End of Grand Cayman. The East End of the island offers a unique experience for those wishing to get away from it all. Atlantis Diving - Atlantis Diving is active on the island of Curacao since 1989 and has the reputation to be one of the best and most professional scuba facilities on the island. The dive shop is located on the Drielstraat 6 near the centre of Willemstad on the waterfront of the caribbean sea. Caribbean Sea Sports - Caribbean Sea Sports is more than just a PADI 5* dive shop. Located on the pristine white sands of the beautiful Curacao Marriott Beach Resort & Emerald Casino, we can offer a full range of water sports and beach activities in addition to some of the best and safest Curacao diving you'll ever experience. Discover Diving - On this site you will find all the information regarding Discover Diving Curacao, our rates, driving directions, it's all there. We also host a constantly changing photo archive. Dive Bus - You'll find The Dive Bus right on the beach next to Breezes Curacao Resort, with the famous Car Pile dive site and beautiful Pierbaai Reef on the doorstep. Dive Center Aquarius - The dive shop has a NAUI Course Director in house so we are able to Instructor Trainer courses to give. This year will also be the opportunity for IDD receiving training through Instructor. Dive Wederfoort - Diving School Wederfoort is located in St. Michiels Bay, 10 min. from the Airport and just 5 min away from Snake Bay, Vaersenbay and Blue Bay. These beaches are good for Swimming, Snorkeling and Diving. Ocean Encounters - Ocean Encounters has six locations on Curacao. Their family-owned scuba diving operation is a PADI Five Star IDC Resort and National Geographic Scuba Diving Center. PortoMari Sports - Our diving school provides lessons up to a maximum of four persons so that you can be sure to get the attention you need and deserve from the instructors. We can also provide private lessons if you want, take an introduction dive, or take a course up to divemaster level. Dive Dominica - Castle Comfort Lodge is the epitome of a small intimate Caribbean dive lodge, located one mile south of the capital Roseau. We are a 15 room dedicated family owned and operated dive resort and also home to Dive Dominica. Terrific diving can be done at "Paradise reef"," Las Cuevitas", "The Astron Wreck", and "Deep Blue" among many more, and each sites is visited numerous times through out the day. Reef diving, wreck diving and cave diving are offered among other special offers, which are all part of our extensive dive program. Aligatour - We conduct all PADI certifications from introduction to diving (Discover Scuba Diving) all the way to the commercial level of diving guide (Dive Master). Also we include in our program Referrals and Refresher courses. Big Blue - We only dive with certified Divemaster or Instructors. Safety, fun and quality are very important for us. So come and join us. We are looking forward to meet you. Caribbean Divers - Our diving school and our team is involved in many different ways for the protection and preservation of the unique underwater world of the Dominican Republic. Caribbean Marine - Worldwide travelers visit the Dominican Republic for its warm sands and amazing onshore destinations, but avid snorkelers and divers visit our island for another reason. Ducking your head under the incredibly blue tropical waters off its coast can dazzle you with sights beyond compare. Neptuno Dive Center - Apart from the beautiful tropical coral reefs, our dive sites are particularly interesting for divers interested in underwater wrecks and cave diving. North Coast Diving - Northern Coast Diving is a PADI 5 Star Instructor Development Center, Gold Palm Resort and National Geographic Dive Center. Discover Scuba Diving in the warm Caribbean waters of the Dominican Republic with the best of the North. ScubaCaribe - ScubaCaribe specializes in providing a complete range of water sports and activities for hotels and resorts. The company was formed in 1991 when it began operating and providing services for the Riu Hotels in Punta Cana , Dominican Republic. Sea Pro Divers - As our name states Sea Pro, we are sea professionals specializing on everything from diving to kayak, snorkeling, windsurfing, sailing, under water photography and numerous of other activities. Treasure Divers - Treasure divers has more than 18 years of experience with a team of professional diving instructors. We are located at Don Juan Beach Resort in Boca Chica. Treasure Divers, with more than 20 years of experience and ranked 3 times as the best dive center in the Caribbean by the biggest diving magazine in Europe, is driven by a professional team of instructors, who have a love and appreciation of the marine world, and are concerned with the well-being and satisfaction of their customers. We participate in different environmental projects and have filmed underwater videos for the French and German television Arte. We provide wonderful local diving and different exceptional diving excursions. Our cave diving has been ranked in the 100 best dive spots in the world. Guadeloupe and its islands are some of the most beautiful diving destinations in the Caribbean. The waters around Guadeloupe are home to the most beautiful species that nature has created, more than a hundred varieties of sponges corals, and shoals of fish of all kinds. Here you'll find rays, turtles, dolphins, barracuda, angels, eels, lobster, and kingfish. You can also hear the songs of majestic humpback whales. Divers on all levels can find something to satisfy their curiosity in warm, clear water. Dive Bouteille - In a rare setting, where everything is pure harmony, the shop, the boat, the dive spots, you will have a grand time with Sylvie and Luc. Captain's Watersports - Diving and parasailing at a number of locations in Jamaica. Dive Seaworld - Jamaica's shallow reefs offer a comfortable introduction to coral reef diving for the beginner. Non-certified divers may take a short Resort Beginners Course and go diving the same day. Beginner to advanced classes and instructions are available for upgrade or open water certification. All dive sites are located within minutes of our resort. Dream Team Divers - Dream Team Divers Jamaica welcomes novice and experienced scuba divers alike to enjoy scuba dives, scuba diving classes, scuba diving certification or scuba diving equipment rental while in beautiful Negril, Jamaica. Marine Life Divers - Dive at our house reef just few yards away from the Dive Shop. Excellent for Night Dives, there is a giant stride entry from the platform and you are already on the reef. Enjoy the wide variety of Fish, Corals and other Sea Creatures. Negril Scuba Center - Negril Scuba is a full service dive operation offering both shore and boat dives to the best dive spots in Negril. We have multiple locations along with equipment rentals for anything from one to 20 divers. Sun Divers - What better place to experience Jamaica, but in Negril where you will find a paradise for diving and watersports. The sounds of reggae music fill your ears and the smells of tasty Jamaican food dance on your taste buds. All of this with friendly faces and lots of fun. Culebra Divers - We have operated for 20 years in the dive business in Culebra and we love to share our experience with you. We are a small company and our sincere goal is to provide you with a great experience. Scuba Dogs - Scuba Dogs is a diving school established in October of 2000 in the heart of Guaynabo, San Juan with much love and effort by its owners, Elsa & Alberto Marti. Our name is Scuba Dogs because we're "Diver's Best Friend," thus reflecting our commitment to providing an excellent service in a pleasant, safe and fun environment. Sea Ventures Dive Centers - We are proud to be a 5-Star member of PADI, the world's largest diving organization, where diver safety is of the utmost concern and our Professional Dive Staff are 100% PADI Certified. Locations in Fajardo and Plamas del Mar. Marine Service - West Indies Dive is a diving centre ANMP and PADI Gold Palm in the heart of Gustavia. A friendly welcome and comforting reception before your discovery the underwater beauty in St Barth, at less than 15 minutes from the port. Ouanalao Dive - From experts to beginners, all divers are invited to join Turenne Laplace and his colleagues in an enchanting aquatic universe, filled with fabulous flora and fauna. Your only problem will be leaving this underwater wonderland. Plongee Caraibes - Plongee Caraibes is a St. Barths PADI dive school offering all certifications from Discover Scuba Diving to Dive Master certificate. The professional and friendly dive instructors speak French, English, and German. Anchor Dive Center - Welcome to Anchor Dive Center, the only dive center located within Salt River Bay National Park and Ecological Preserve. Whether you're looking for a day of fun or a lifetime of memories, our first class staff will help you create a customized Dive Package or Adventure Package for every guest. We are a full service PADI Dive Center. Cane Bay Dive Shop - Dive St. Croix when you want to. Scheduled and unscheduled dives go out daily. Our standard dive shop hours are 8 am to 7 pm, seven days a week. Upon request, we can do anything from sunrise dives to full moon midnight dives. Come join us at our unique family fun dive and snorkel shop on St. Croix. Dive Experience - Our dive masters and instructors have years of experience scuba diving and dive training in our beautiful caribbean waters. Whether you are new to diving or a veteran scuba diver, you'll appreciate the professionalism at Dive Experience. N2 the Blue - N2 The Blue specializes in small group diving, with a maximum of 6 divers per boat. Whether from our custom dive boats, or going right off the Frederiksted Pier, our personalized experience and unlimited bottom time makes us an excellent choice. Our dive shop is in front of the the Frederiksted cruise ship pier, and the closest shop to the shipwreck dives on St. Croix. ScubaWest - Our ScubaWest family is located on the leeward side of the island in the township of Frederiksted. An 18th Century Danish colonial port, Frederiksted is the gateway to continually ideal dive conditions. With the trade winds steady out of the east, we enjoy calm seas year-round, and the sheltered reefs within sight of the picturesque and peaceful Frederiksted waterfront are among the healthiest and most vibrant in the world. Cruz Bay Watersports - Parrotfish, Queen trigger, Blue Tang, Angelfish are just a sampling of the reef residents. Hawksbill turtles, spiny lobster, southern stingrays and spotted eagle rays are common, as are many other fascinating species. Visibility ranges from 50-100 feet, and water temperature between 78-84 degrees. Low Key Watersports - Welcome to Low Key Watersports located just steps from the main ferry dock in Cruz Bay, St. John. Cooper invites you to join us on one of our daily scuba diving or snorkeling tours and discover why St. John is more fun under the water. A PADI five-star IDC facility, we can teach you to dive in no time at all! We also accept, PADI, NAUI, SSI and Universal referrals, as well as offer trips to the RMS Rhone and other wrecks in the area. St. John Dive Adventures - St. John boasts some of the most beautiful and most photographed beaches in the world. Watersports "rule" here. Diving, snorkeling, sailing, kayaking, parasailing, powerboat and dinghy rentals are offered year-round. 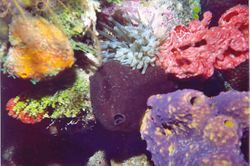 Underwater marine life is abundant on pristine reefs. Water temperatures range from 78 degrees in the winter to 85 degrees in the summer. Dive St. Kitts - At Dive St. Kitts we guarantee that the serene beauty and warm, clear waters of our untouched dive sites will overwhelm you, the peace and tranquility of our islands will refresh you, and the experience, warmth and hospitality of our professional staff will put your mind at ease. Explorer Ventures - St. Kitts offers arguably the widest variety of sites - finger reefs, recent wrecks, and a variety of drop offs that will capture your imagination. Pro-Divers - We offer a personal service and a fun atmosphere which enables you to get the most from your St Kitts diving experience. All dives are led by a PADI Instructor who will give you a thorough dive briefing and help you plan a profile that suits you and your diving experience. Scuba Safaris - Explore virgin reefs among majestic stands of pillar coral, sea fans and long slender tube sponges. Dive among schools of snappers, angelfish chubs, jacks, and barracuda while graceful southern stingrays, eagle rays and turtles glide lazily by. St. Kitts Scuba - What makes St. Kitts special? Blue sea fan gardens, intensely fluorescent sponges, friendly barracudas, spiny lobsters, peacock flounders, turtles, turtles, turtles, sting rays and garden eels along with all the abundance of sea life found in the Caribbean. Action Adventure Divers - The establishment of the only marine park, the Soufriere Marine Management Area (SMMA), has provided a protected natural breeding ground for a very wide range of coral and reef fish. Action Adventure Divers is proud to let you know that its Operations Manager was one of the first SMMA Rangers and also a fisherman who has intimate knowledge of reef location, local tide and current conditions. Island Divers - Island Divers is the dive shop on property at Ti Kaye. Located in the building on the beach below the resort, shared with Ti Manje restaurant. Few dive shops in St Lucia are located right in front of a diving hot spot and none have a wreck. So it's really one of a kind. Frogs Diving - Established over 15 years ago by Tommy de Nobrega, a Master Diver (PADI, MSDT, EFR) and former British Army diving supervisor, we are situated within the Harmony Suites in beautiful Rodney Bay and easily accessible from all major resorts. Scuba St Lucia - Just a mile and a half from the picturesque town of Soufriere on St Lucia's south-western Caribbean shoreline, Scuba St. Lucia is part of the resort of Anse Chastanet, nestled amidst a 600 acre tropical estate with two soft sand beaches bordering on pristine coral reefs. Aqua Mania - St. Maarten is a great dive destination. The outlying wreck and reef sites offer fantastic dives and excellent photo opportunities. For the average diver whose partner or family do not dive, here is where St. Maarten excels. Plenty of beaches, snorkeling, activities, shopping and day trips to keep everyone entertained while the divers go about the pleasure of diving. Blue Bubbles Watersports - Offering a full range of watersports excitement, Blue Bubbles watersports caters to both hotel and timeshare guests, as well as mega yacht and cruise ship visitors. Do ask about our special rates for cruise crew, local islanders and St. Maarten medical students. Bobbi, Catherine and their staff are looking forward to showing you a great time in, under and above the water. Dive Safaris - Dive Safaris offers daily dive trips from its Simpson Bay location. All dives are guided (except for our shallow single tank dive at Little Bay). By far the most popular of our dive trips, are the Double Tank Dives. These 4 hour tours will allow divers of any level to participate in 2 consecutive guided dives during which reefs and/or wrecks will be visited. Each dive last around 40 min. and are separated by a 30 min. surface interval. Scuba Fun - Between Saint Maarten and St.Barts, any level of diver can enjoy a choice of over 40 different dive sites. Whether it's your first try or if you're already certified, scuba or freediving, the abundant marine life of the crystal clear Caribbean Sea is waiting to be discovered by you. These warm waters give rise to a wide variety of sea life, everything from small and beautiful to the weird and wonderful. The Scuba Shop - The waters of St. Maarten / St. Martin and the surrounding islands offer very interesting and varied scuba diving at moderate depths, which means easy and relaxed diving and snorkeling. Besides numerous varieties of reef fish, you are likely to see Great Barracudas, Tarpon, Flying Gurnard, Moray Eels, Snake Eels (there are no sea snakes in the Caribbean), Stingrays, Spotted Eagle Rays, Manta Rays, Sharks - both Nurse and Reef, Turtles, Lobster, and a lot of macro critters. Sea Horse Diving - Within a framework of Paradise, Alain will help you discover the sea beds of Saint Martin, one of the most beautiful islands in the world. Admiralty Dive Center - Admiralty Dive Center is a full service St. Thomas dive center centrally located at the Windward Passage in Charlotte Amalie, St. Thomas since 1994. With over 80 sites to choose from we offer a new and exciting dive daily. Aqua Action Dive Center - Join us in a far away place, where creatures of all colors, shapes and sizes co-exist in harmony. Let us show you a kingdom of beautiful mountains, valleys, canyons, plains and caverns. Blue Island Divers - We specialize in complete packages to insure that your Dive Trip to St. Thomas is a great experience. We offer packages that can include hotel, diving, transportation to and from the airport and additional activities. Dive In! - - Dive In! is the ultimate way to experience scuba diving on St. Thomas, within the U.S. Virgin Islands! Need dive lessons? Take the PADI certification course! Our Sapphire Beach dive center is headquarters to our veteran staff of professional PADI instructors. Our full service dive center offers (at no extra charge) all the scuba equipment for your diving needs. Homer's Scuba and Snorkel - Homers Scuba and Snorkel Tours is the last of the small businesses in St Thomas, not wanting to follow the trend of how many people can we get on a tour, Homer still believes there is a market for small groups that want quality service with that personal touch, so you feel you're on an excursion with friends. Red Hook Dive Center - Red Hook Dive Center is Open for business at the former location of Chris Sawyer Dive Center in American Yacht Harbor and the Wyndham Sugar Bay Resort. We invite you to stop by and check out the new, refreshing look. Red Hook Dive Center is a full service PADI dive shop offering multi-levels of dive instruction, daily dive excursions, private charters, rental gear, air/Nitrox fills, equipment service, snorkel and dive accessories. St. Thomas Diving Club - In addition to the basic open water certification, St. Thomas Diving Club offers a full range of PADI instruction from a Discover Scuba Diving experience through instructor training with our onsite Course Director. Our dive classes are small so you always get personal attention. The education you receive will leave you confident in your dive skills and give you the training you need to relax and have fun in the water. We offer small groups and personal service to make your diving vacation one you won't forget. We can arrange a shore excursion from your cruise ship, and welcome guests from any hotel on the island. Underwater Safaris - Has two boats and PADI instructors. Bequia Dive Adventures - Bequia Dive Adventures is located on the beautiful Grenadine island of Bequia, St Vincent & the Grenadines. We are a full service PADI Dive Center conveniently located along the harbor walk in Belmont, a few steps from numerous excellent guest houses, small hotels and restaurants. Dive Bequia - Dive trips depart daily at 0900, 1130 and 1430, each trip returns approximately two hours later. Light refreshments, breakfast and lunch are available dockside at The Gingerbread's cafe shaded under an Almond Tree. UBS Dive Center - A small operation that specializes in private, personalized, full-service dive, snorkel and island-hopping adventures and powerboat rentals. Each trip is tailor-made exclusively for you, your family and your friends. Prices are inclusive of scuba diving and snorkel instruction, all dive and water sport equipment, guided underwater tours, eco-education, reef and fish identification, soft drinks and towels. Aquamarine Dive - AquaMarine Dive is a PADI Gold Palm facility conveniently located on premises of the Blue Waters Inn, catering to all levels of certifications and divers. Open 365 days a year to suit your vacation needs with dive sites just two to five minutes from our private dock. Caribstu - My exclusive dive service is designed for the diver who wants to enjoy the reef and dive without the crowds. I dive all the best dive sites of Tobago, from Speyside to Crown Point, and provide my guests with a professional, friendly, personal dive service. Extra Divers - Spectacular bays, dense rainforest, breathtaking waterfalls, white sandy beaches, colorful festivals and of course top dive sites with a vast variety of different species guarantees a Caribbean holiday you have always been dreaming about. R&Sea Diver's Company - Departure point for our daily scuba diving trips is from our dive shop on the beach along the road to Pigeon Point, which is one of Tobago's most popular beaches. Our rental department has a full range of scuba regulators, BCDs, masks and snorkels, torches and wet suits available for those who don't have their own diving gear. Some of the dive sites within a short boat ride from the dive shop include Flying Reef, Cove Crack, The Shallows and Majeston. Tobago Dive Experience - The diving in Tobago is little known by the rest of the world, but recent reviews in Sport Diver and other diving magazines seem to be raising the profile of this small Caribbean island. The Speyside area has some of the best diving in the Caribbean for the more adventurous diver, whilst the South-West has much more easy diving for the more casual diver. Add to this regular visits of the Manta's, what more could you ask for? Tobago Frontier Divers - Divers have little difficulty sighting barracudas, dolphins, whale sharks, nurse sharks, and turtles as well as sting rays. These are just some of the wonders awaiting the scuba diver in Tobago. There are extensive fringing reefs and rocky reefs including the Japanese Gardens, as well as underwater cliffs and canyons covered with corals and sponges. The variety of good dive sites means there are easy dives for the novice and challenging dives for the experienced. Undersea Tobago - Undersea Tobago is owned and operated by the husband and wife team of Derek & Evelyn Chung. Diving in Tobago waters for over 15 years has given them the experience and local knowledge necessary to be able to give you an exhilerating and safe diving experience. Wild Turtle Dive - We dive all around Tobago, including Crown point, Speyside and Sisters. Small groups with great service and personable staff, Wild Turtle Dive stand's out as Tobago's premium quality dive resort. World of Watersports - Tobago is a year round Caribbean scuba diving destination, as our wet season usually consists of short sharp showers, which at most times are a welcome respite from constant sunshine. We are located about 11 degrees north of the equator which is outside of the normal paths of hurricanes, which may mean the odd windy day, as the beginnings of tropical storms pass us by, but rarely ever disrupt our diving schedule. Dive BVI - Offering the most experienced and best equipped scuba diving in the British Virgin Islands, Dive BVI is your best choice for diving, snorkeling, and day trip experiences. We specialize in fun. Paradise Watersports - We are located at the Peter Island Resort marina and our hours are usually 9:00 am to 4:30 pm 7 days a week. Certified divers can sign up for our 2 tank morning dives, new divers enjoy our afternoon resort courses, and snorkelers love our tours to some of the most famous sites and reefs in the BVI such as The Indians and Norman Island's The Caves. Sunchaser Scuba - We are located at the Bitter End Yacht Club (BEYC) in the North Sound, Virgin Gorda. If you're not staying here we offer convenient rendezvous diving and / or hotel pick up's from Biras Creek Resort and Leverick Bay. If you're staying at Saba Rock, their free ferry will drop you off at our dock. If you're staying elsewhere in Virgin Gorda we'll be happy to pick you up from the Government ferry dock at Spanish Town.